As the name says, this project is an homage to Archimedes, in specific to his theorem on the sphere and cylinder. Archimedes was the first to demonstrate that the volume of a sphere inside the cylinder containing it is two-thirds of the volume of the cylinder itself. He was so proud of this specific finding that had a sphere and its surrounding cylinder engraved on his tombstone. To be able to show this theorem through an object felt natural to use clear glass, as every other material would hide this play of two shapes. Blowing a cylinder with a perfect sphere inside the glass cylinder is impossible. Mould can't be used either, as when blowing in the mould inside shape starts adapting to the shape of the mould, so I needed to find skilled blowers. 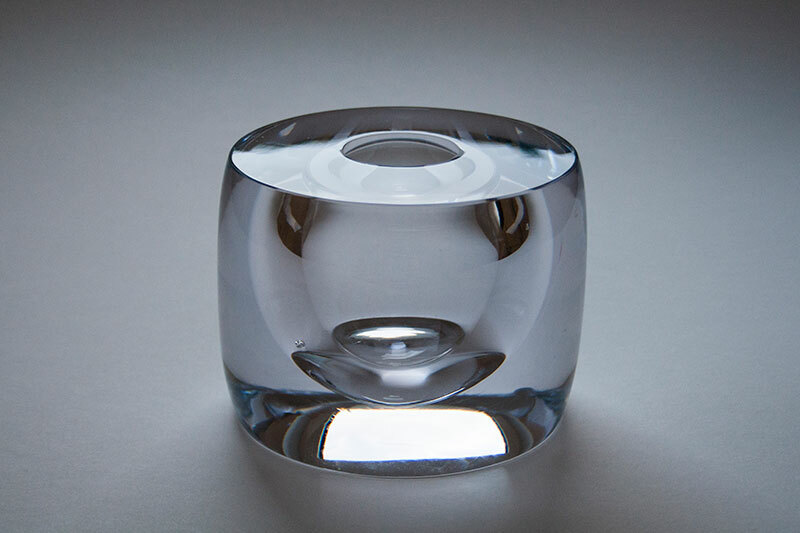 I was lucky to find a glass studio in Finland willing to experiment; a perfect sphere is first created by blowing, after this the sphere is dipped in glass and cylinder formed around it. The problem with this technique is that forming the outer shape influences the inner shape, so great attention is needed to make sure the shape of the sphere is not deformed. Even if the final cylinder stays slightly curved this shows perfectly the original idea; sphere inside the cylinder.